Oh my gah! Arya!!! Best character! 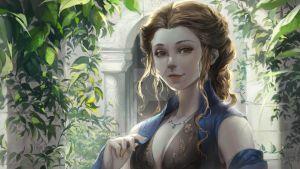 My favourite Stark, she is very sly ,clever and strong. The Starks send their regards, ya dirty old Frey lech. She looks really cool in your style, I love the pose and how her hair flows, great job! Arya! Yeah! I really like the way you showed her as described in the books rather than in the show. People had forgotten about Arya, they had thought the young wolf girl dead and buried. But she survived and she will take her vengeance on all those who betrayed her family. My favorite one in the show !!!! She's absolutely perfect in your style !!!!! It's amazing~ I love your style.